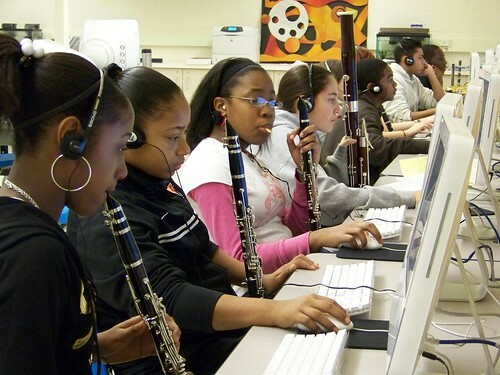 To your comment: “Back in the day when I was a kid, there was music education in public schools. Kids got instruments and didn’t have to pay for private lessons their parents might ill afford. That is largely gone now.” This is very true…I recently heard that the public school that my daughter attended for Kindergarten (only) had lost their Music and Art class, that only two years ago existed. I am not sure what happened there, but I do know that it only existed at that time as well, (two years ago) due to the heavy parent involvement and fund raising that the parents committee did to pay for the Music and Art Teachers. Now that is gone, which makes me wonder where the $350,000.00 that they were raising each year to cover those Teachers is going to now? Its very sad and leading parents to leave the Public schools to provide those extra via Private school to their kids. Definatley it is up to the parents of those kids to provide Music either by Private school (my dauther has Music and Recorder lessons in her Private School -Music class once a week) and Private Lessons, -the School my daughter attends also has a Band, but those lessons are also not free, and require an extra $50.00 a month to cover! If I had more than one child, I would be hard pressed to provide all this. Where is the Tax payer money going? The mismanagement of the School Boards is reprehensible!! yes, the priorities are really skewed. but remember America is ill-at-ease with the sort of secular humanism that promotes the arts…..why don’t we have a Minister of Culture? What makes El Sistema so amazing is not only do they train kids to be musicians, but they train them to be classical musicians and make them excited not about Lady Gaga’s next dress but about Handel and Bach! Such a high level. We’re lucky to have Gustavo here but so much more needs to be done.